Here at the Swift Agency, still just a guy who has to work tomorrow, we’d like to congratulate the winners of the 48th ACM Awards last night! Sorry, Taylor didn’t win. She’s had a lot of moments, she will win a few and lose a few like everyone else. The important thing is like she did, to have fun and let other people also enjoy some of the spotlight for a while. I am happy for all the winners last night. Special mentions go to Eric Church’s Chief for winning Album of the Year. That album is wicked good and you should listen to it. 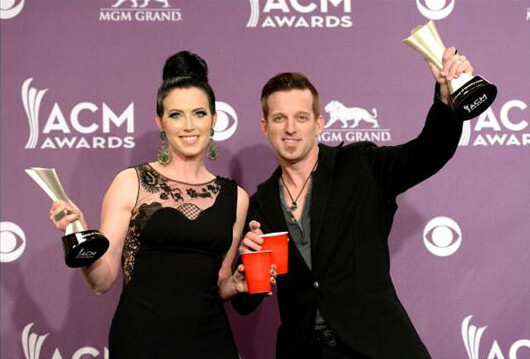 Thompson Square won for Vocal Duo of the Year and you should check out their work! Vocal Group of the Year went to Little Big Town, who have been nominated so many times and I’m so glad that they’re finally reaping the rewards – and awards – of their hard labor. And yes, I will mention Luke Bryan because everyone of those nominees up there deserved to be Entertainer of the Year. Let him have his moment. Thanks to AwesomeArtistsLive2 for posting and a big shoutout to ‏@Arielszy for the heads up! And speaking about performances… The Band Perry really knocked it out of the park with the most kickass performance of the night. If you want a reason to watch the show, watch them take the stage for Done. It’s really heart-stopping. The Enchantress will appear in Tim McGraw’s Superstar Summer Night this Monday, April 8. CBS will broadcast the show on May 19. April 8: ACM Presents: Tim McGraw’s Superstar Summer Night at the MGM Grand Hotel in Las Vegas, NV. Tickets on sale on Ticketmaster. April 10: The Red Tour at American Airlines Arena in Miami, Florida. On sale now. More information on Ticketmaster. April 11 and 12: The Red Tour at Amway Center in Orlando, Florida. On sale now. More information on Ticketmaster. April 18 and 19: The Red Tour at Philips Arena in Atlanta, Georgia. On sale now. More information on Ticketmaster. April 20: The Red Tour at Tampa Bay Times Forum in Tampa, Florida. On sale now. More information on Ticketmaster. Previous Previous post: The 48th ACM Awards Swiftlist: What you need to know tonight!